The Bush administration is waging a virtual war on the environment enabling industries to decimate forests, divert water, pollute national parks, and release CO2 and toxins into the atmosphere. This disregard for the environment reflects core values of the theocratic right, a movement strongly allied with big corporations. The theocratic right should not be confused with Evangelicals, a group that covers the entire political spectrum. The Texas Republican Party Platform, a document that reflects the goals of the theocratic right, opposes efforts to regulate industry by affirming a belief in "a strong and vibrant private sector unencumbered by excessive government regulation." It calls for abolishing the Environmental Protection Agency, and reaffirms "the belief in the fundamental right of an individual to use property without governmental interference." It also opposes conservation easements administered by nonprofits. On April 17, 2005, the New York Times published an article about the Constitution in Exile movement. Their judicial philosophy extols the absolute rights of property owners which is also reflected in the Texas GOP Platform. For years, Religious Right groups have anchored their views on environmental issues in Genesis 1:28. "Because nature is wild," explains Nina George Hacker in Concerned Women for America's Family Voice, "we [humans] were given the authority to 'subdue' it for life's necessities." This editorial from the New York Times -- Destroying the National Parks, (August 29, 2005) illustrates the impact of the theocratic right on our national parks. ...In short, this is not a policy for protecting the parks. It is a policy for destroying them. A few days after Justice Sunday II antigay crusader James Dobson and Focus on the Family launched an attack on Christianity Today magazine. The reason was Andy Crouch's article, "Environmental Wager," that urged Christians to become concerned about and active in fighting global warming. Dobson and FOF believe global warming is "junk science," despite the fact that virtually every reputable scientist in the world supports the idea. It's hard not to, given the overwhelming evidence. But Dobson's bible-based environmental science is not new. Three Focus on the Family executives - including founder and chairman Dr. James C. Dobson - have signed on to an open letter to the American people stressing the importance of relying on biblical values in selecting candidates on Election Day. Deregulation of industry lies at the heart of the Religious Right agenda. The Washington Post has published a three-part series detailing how the Bush administration is systematically dismantling the regulatory functions of government in ways that are not obvious and receive little public debate. The lifting of regulations by the Bush administration is devasting to the environment and public health. The first article from the Post is called Bush Forces a Shift In Regulatory Thrust, OSHA Made More Business-Friendly, August 15, 2004. The second article, August 16, 'Data Quality' Law Is Nemesis Of Regulation talks about the health threat of a law to deregulate chemicals. The third article, August 17, Appalachia Is Paying Price for White House Rule Change explains how Bush administration rule changes are devastating the environment. A study reported on CNN News, The Unborn babies carry pollutants, provides striking example of why regulations are important. Click here. The American Legislative Exchange Council represents a marriage of the Religious Right and big corporations. Founded in 1973 by conservative activist Paul Weyrich and a handful of state legislators, ALEC initially positioned itself as a counterweight to liberal foundations and think tanks, focusing on social issues like abortion and the Equal Rights Amendment. In a move worthy of Orwell's Big Brother, the Washington state legislature is being asked to fund a law enforcement database of "eco-terrorists" that would in fact track citizens engaged in lawful environmental advocacy - including signing a petition to save old-growth forests, attending a rally for clean air, or simply joining a group like the Sierra Club or Defenders of Wildlife. The term "Religious Right" is not synomous with "Evangelical." In contrast to the Religious Right, the Evangelical Environmental Network assumes responsiblity for protecting and restoring the environment stating: "Because we worship and honor the Creator, we seek to cherish and care for the creation." And the Religious Right is not a monolithic bloc. While legislators pushing the religious right agenda receive remarkably low scorecards from the League of Conservation Voters, James Dobson of Focus on the Family who is one of the most powerful figures of the Religious Right, actually signed an "Evangelical Call to Civic Responsibility" that, for the first time, emphasized every Christian's duty to care for the planet and the role of government in safeguarding a sustainable environment. "We affirm that God-given dominion is a sacred responsibility to steward the earth and not a license to abuse the creation of which we are a part," said the statement, which has been distributed to 50,000 member churches. "Because clean air, pure water, and adequate resources are crucial to public health and civic order, government has an obligation to protect its citizens from the effects of environmental degradation." George W. Bush will go down in history as America's worst environmental president. In a ferocious three-year attack, the Bush administration has initiated more than 200 major rollbacks of America's environmental laws, weakening the protection of our country's air, water, public lands and wildlife. Cloaked in meticulously crafted language designed to deceive the public, the administration intends to eliminate the nation's most important environmental laws by the end of the year. Under the guidance of Republican pollster Frank Luntz, the Bush White House has actively hidden its anti-environmental program behind deceptive rhetoric, telegenic spokespeople, secrecy and the intimidation of scientists and bureaucrats. It's no secret that the Bush White House and Republican National Committee serve the interests of polluting industries in exchange for big campaign contributions. But there's more to the story. As is well known, Bush and the Republicans have been generously funded by business foes of regulation. According to a Public Campaign and Earthjustice report, mining, timber, oil and chemical industries have contributed more than $44 million to Bush and the Republican National Committee (RNC) in the last three years. Less well-known is that Bush's opposition to regulation is part of an electoral strategy designed to win the votes of coal, timber and oil-producing states. These include the eastern swing states of West Virginia, Kentucky and Pennsylvania, as well as traditionally Republican states in the West and Southwest. Federal land conservation and environmental programs would bear the brunt of budget cuts next year under budget limits sent to the House Appropriations Committee's spending panels yesterday. The Bush administration announced on December 23, 2003, that the Tongass National Forest in Alaska, the largest in the country, would be exempted from a Clinton-era rule, potentially opening up more than half of the 17 million-acre forest for more development and as many as 50 logging projects. On January 24, 2004, Interior Secretary Gale A. Norton cleared a plan to open 8.8 million acres of Alaska's North Slope to oil and gas development. The plan will be used to manage a northwest part of the government's 23.5 million-acre National Petroleum Reserve in Alaska, which geologists believe may contain 6 billion to 13 billion barrels of oil. The plan threatens the health of Arctic tundra, ponds and lakes that are home to wildlife and migratory birds, and will probably produce enough oil for six months only. Two riders attached to the Senate Omnibus bill, December, 2003, would weaken air pollution rules and weaken protections for dwindling fish species. Nature at Bay, New York Times, May 9, 2005 - an update on the war on nature. On March 23, 2004, the Bush administration eliminated a requirement for federal agencies to survey for rare species in Pacific Northwest forests and establish buffers to protect them, a change that will open up thousands of acres of old-growth forest to industrial logging. "comes straight from corporate timber interests, which have yet to encounter a question to which more logging isn't the answer." "[In] the so-called forest stewardship program, ... timber companies are allowed to harvest trees as payment in kind for other projects like road clearing or the thinning of underbrush to prevent forest fires. Conservationists fear that open-ended, broadly drawn stewardship contracts will give the loggers license to cut huge tracts that would otherwise be spared." "reckless and insupportable decision to eviscerate a central provision of the Clean Air Act and allow power plants, refineries and other industrial sites to spew millions of tons of unhealthy pollutants into the air." "Bush Administration to Gut Clean Air Act. Rule Would Allow More Pollution at 17,000 Facilities," claims the Natural Resources Defense Council. From the U.S. General Accounting Office: The Bush administration has undermined enforcement of the Clean Air Act. The public will be breathing dirtier air—and many of us dying sooner—as a result. The following press release from the Natural Resources Defenses Council criticizes the Bush administration for joining with Detroit to fight California's zero emissions vehicle. The "federal government's siding with Detroit is an unprecedented attack on California's legal right to regulate air pollution." "A bipartisan group of Northeastern governors is expected to announce an historic agreement this week to reduce carbon dioxide emissions from power plants, a plan that would break sharply with Bush administration policy on global warming." A federal appeals court blocked some of the Bush administration's planned revisions to the Clean Air Act just three days before the EPA plan was to take effect. A three-judge panel agreed with 12 states and several major cities that the changes could cause irreparable harm to the environment and public health. The revisions center on repairs made to pollution-causing facilities. "On issues large and small, the Bush administration has spent the better part of two years rolling back Bill Clinton's environmental legacy. It has abandoned the Kyoto accord on global warming, weakened protections for wetlands and eased mining laws. "Now it appears to be aiming at even bigger game - the National Environmental Policy Act, regarded as the Magna Carta of environmental protection and perhaps the most important of all the environmental statutes signed into law by Richard Nixon three decades ago." NY Times Editorial, September 30, 2002, "Undermining Environmental Law." In all, the mine safety agency has rescinded more than a half-dozen proposals intended to make coal miners' jobs safer, including steps to limit miners' exposure to toxic chemicals. One rule pushed by the agency would make it easier for companies to use diesel generators underground, which miners say could increase the risk of fire. On February 7, the Bush administration sought an exemption to a ban on methyl bromide, a chemical that harms the ozone layer. He is now instituting that ban, threatening to unravel the Montreal Protocal to protect the ozone layer, the most successful treaty in the history of the environmental movement. Environmental writer, Glen Scherer, has writter an article in Salon on this important decision. Ultimately, the exemption was not approved by an international agency on the ozone layer. The New York Times reported on March 4, 2004, "U.S. Requests Exemption to Ozone Pact For Chemical," that the Bush administration filed a new exemption request with Montreal Protocol administrators requesting an additional 1.1 million pounds to the 2005 exemptions. The Washington Post, October 12, 2004: "... the Agriculture Department will allow the use of methyl bromide, a fumigant that harms the ozone layer, to treat wooden shipping pallets..."
... the United States and several other countries gained permission to continue using substantial amounts of methyl bromide through 2006 despite a ban that is to take effect in wealthy countries on Jan. 1. The chemical destroys ozone but is a popular weed and pest killer. Wetlands Protection Fades By and then, Politics or Change of Heart? The New York Times, February 11, 2003, claims that for the past two years the Army Corps of Engineers has been undergoing a "broad retreat" in the amount of wetlands it protects. The President reversed a proposal that would have opened millions of acres to commercial development and the pollution that goes with it. "The decision to reverse course is directly traceable to Mr. Bush's calculation that the proposal was politically unsustainable." "Here's why the environmental community isn't ecstatic over President Bush's call to spend more than $1 billion over five years to develop a hydrogen-powered car to wean us from our addiction to Middle East oil." Robert Kennedy Jr. discusses problems with Bush's proposal for fuel cell cars in this New York Times Op-ed, February 16, 2003. The White House is proposing that the military be exempt from environmental regulations, reported in New York Times, February 6, 2003. In 2002, the Bush administration essentially repealed a longstanding provision of the Clean Water Act prohibiting the dumping of mining wastes in streams. Now, (Jan. 13, 2004) under what is advertised as a "clarification" of the law governing surface mining, the administration is eliminating a ban dating from the Reagan era against mining activity within 100 feet of a stream. Mr. Bush promised to give the program its statutory maximum, $900 million a year, of which half goes to the states and half to federal purchases. This figure has rarely been reached, but under Mr. Bush it has receded even further into the distance. He asked for just over $300 million altogether and House appropriators did even worse, calling for $91.5 million for the states and a measly $48.5 for the federal side. Similarly, they provided only a modest increase in operating funds for the National Park Service - barely enough to keep pace with expenses, never mind their chipping away at the $5 billion maintenance backlog Mr. Bush pledged to eliminate. Snowmobiles, New York Times, August 20, 2004: "U.S. Would Allow 720 Snowmobiles Daily at Yellowstone"
The Bush Administration's 2005 budget "projects" $2.4 billion in federal royalties for oil and gas leases in the Arctic National Wildlife Refuge in 2006, even though the Senate has blocked drilling in the Arctic National Wildlife Refuge for two years in a row. From the Daily Mislead, April 28, 2004. "BUSH DIVERTING ENVIRO FUNDS INTO FOSSIL FUELS"
As Mother Jones reported, "the Bush Administration has been working quietly to ensure that the system used to produce hydrogen will be as fossil fuel-dependent - and potentially as dirty - as the one that fuels today's SUVs. Tucked away in the 96-page emergency military spending bill signed by President Bush this month are four paragraphs that give energy companies the right to explore for oil and gas inside a sprawling national park. February 6, 2004: The Senate Judiciary Committee took up the nomination of a longtime lobbyist for ranching and mining interests who has been a leading critic of environmentalists. The League of Conservation Voters (LCV) publishes a National Environmental Scorecard. The Scorecard provides objective, factual information about the environmental voting records of U.S. Representatives and Senators. more The higher the rating from Religious Right groups, the lower the rating from the League of Conservation Voters. 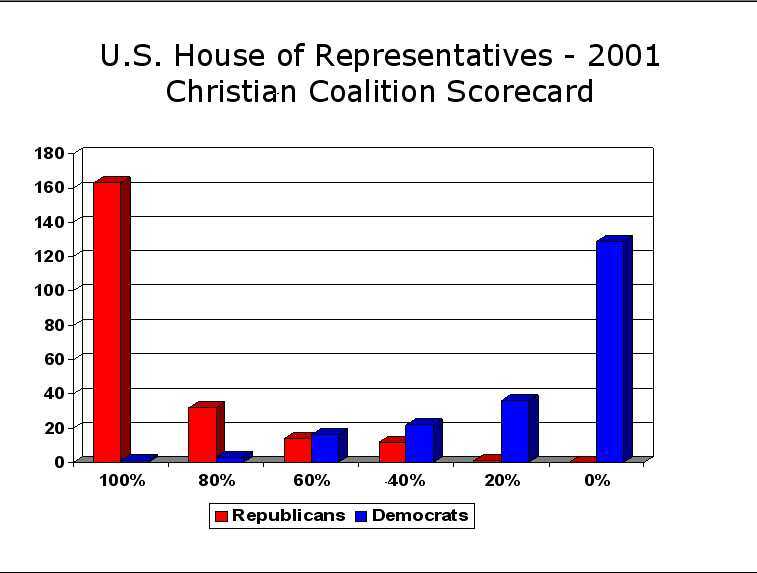 The following graphs compare how Christian Coalition and the League of Conservation Voters(LCV) rated Congress in 2001. Republicans are red, Democrats blue. LCV is made up of several environmental groups. 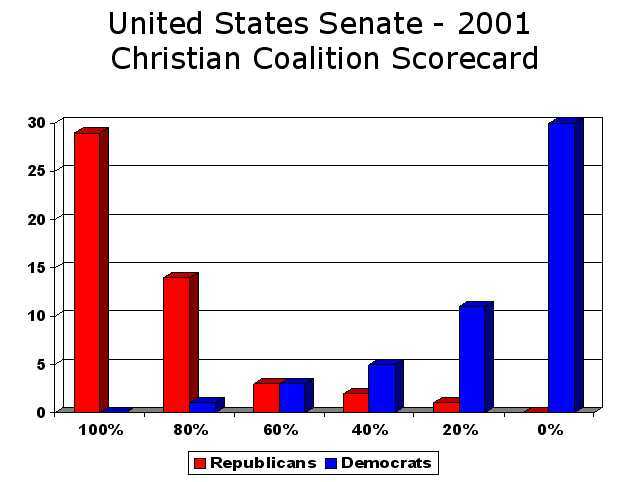 The first graph measures the Christian Coalition's scorecards for the United States Senate in 2001. Republicans, mostly in the 100% column, scored very high. Most Democrats received 0. 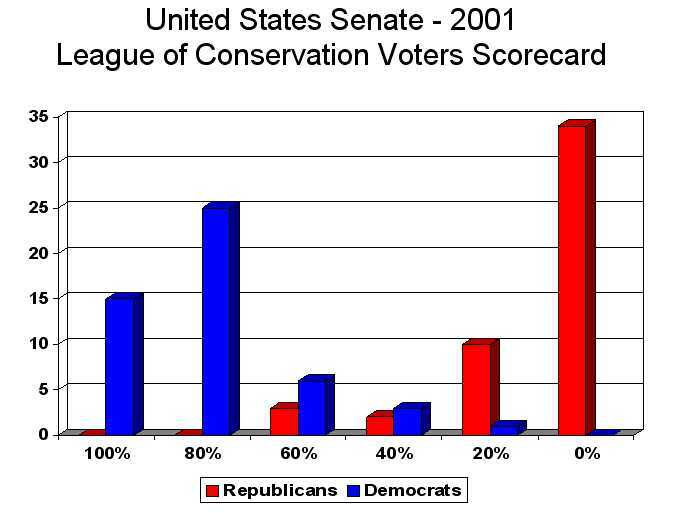 The second graph -- which is the opposite -- shows how the League of Conservation Voters rated the U.S. Senate that year. 15 Democrats voted in favor of environmental issues 100% of the time. 34 Republicans voted in favor of environmental issues 0% of the time. If you add the 25 Democrats who received 80% with the 15 who received 100% the number is 40. 40 out of 50 Democrats in 2001 had strong environmental voting records. If you add the 10 Republicans who received 20% with the 34 Republicans who received 0%, 44 out of 49 Republicans that year had very low environmental voting records. The third graph shows how the Christian Coalition rated members of the U.S. House of Representatives: 100% -- 163 Republicans, 1 Democrat. 80% -- 32 Republicans, 3 Democrats. 60% -- 16 Republicans, 14 Democrats. 40% -- 12 Republicans, 22 Democrats. 20% -- 1 Republican, 36 Democrats. 0% -- 0 Republicans, 129 Democrats. 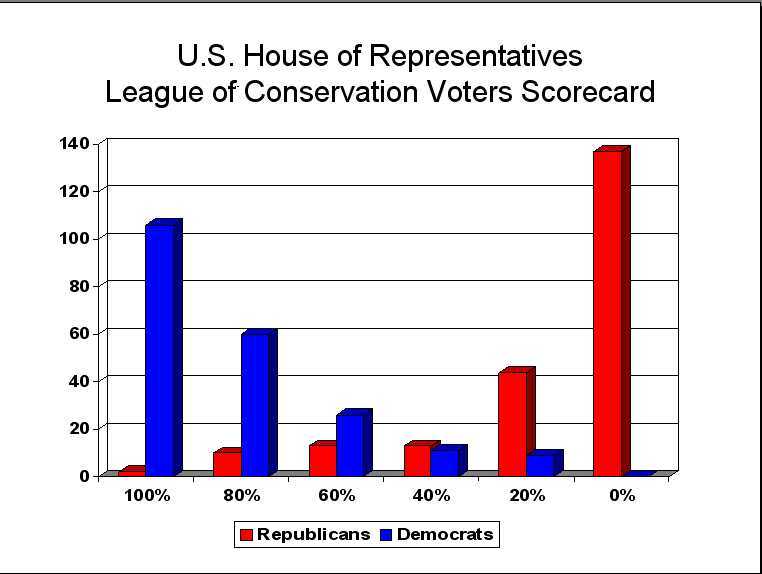 The fourth graph shows how the League of Conservation Voters rated members of the U.S. House of Representatives. 100% -- 2 Republicans, 106 Democrats. 80% -- 10 Republicans, 60 Democrats. 60% -- 13 Republicans, 26 Democrats. 40% -- 13 Republicans, 11 Democrats. 20% -- 44 Republicans, 9 Democrats. 0% -- 137 Republicans, 0 Democrats. 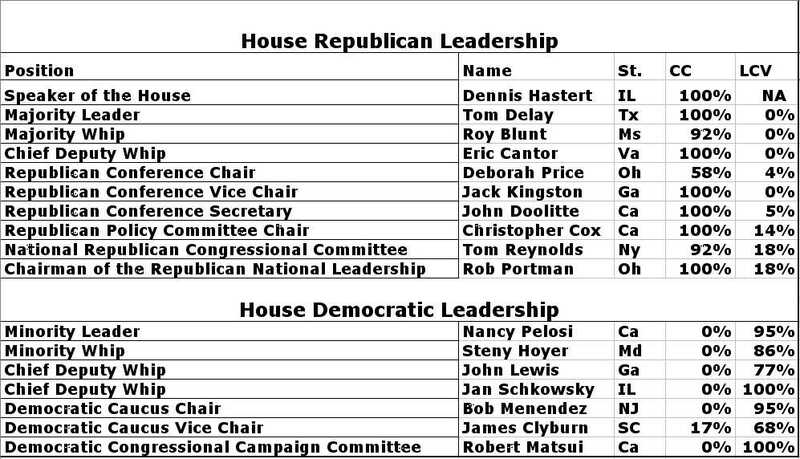 The following two tables compare the ratings of Congressinal leadership from the Christian Coalition and the League of Conservation Voters in 2003. The table on the left is the U.S. House of Representatives. The table on the right is the U.S. Senate. CC stands for the Christian Coalition, and LCV stands for the League of Conservation Voters. While Europe was sweltering in record-breaking heat, Inhofe made an impassioned two-hour speech on global warming. On July 28, 2003, he said, "With all of the hysteria, all of the fear, all of the phony science, could it be that man-made global warming is the greatest hoax ever perpetrated on the American people?" "In an astonishing announcement on global warming and extreme weather, the World Meteorological Organization signalled last night that the world's weather is going haywire." The report cited as an example the 562 tornadoes that hit parts of the United States in just one month -- May, 2003. The New York Times reported that Inhofe convened a hearing on global warming that included only that "small core of researchers who insist there's no evidence for human-centered warming of any sort." (8/4/03) The Times then quoted Dr. Rogers A. Philips, director of the Center for Science and Technology Research at the University of California, noting "We are on the brink of having Republican science and Democrat science." "the environmental extremists and their liberal friends in the press would have you believe that President Bush does not have a good environmental record, and he has the best record than any president in history." 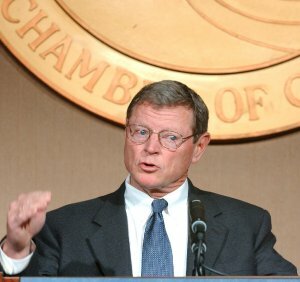 Senator James Inhofe: "In February, 20 U.S. Nobel laureates denounced the Bush administration's political manipulations of science. But if Bush is bad, Inhofe is a kind of scientific Attila the Hun," writes Chris Mooney in Earth Last (The American Prospect, 05.07.04). "James Inhofe proves 'flat Earth' doesn't refer to Oklahoma." "If Inhofe is out of step with science, he's right in line with his conservative and pro-business constituency." "scientific and technical evaluations - known as peer reviews - of all major government rules, plans, proposed regulations and pronouncements." (St. Louis Post-Dispatch, 1/11/04). This enormous policy shift would also put the OMB in charge of how much information the public should be given regarding the "release of emergency declarations from the federal agencies responsible for public health, safety, and the environment." ExxonMobil has pumped more than $8 million into more than 40 think tanks; media outlets; and consumer, religious, and even civil rights groups that preach skepticism about the oncoming climate catastrophe.